Dr. Kyle works at FastMed, an urgent care for kids and adults that specializes in providing prompt, personal medical care 7 days a week. 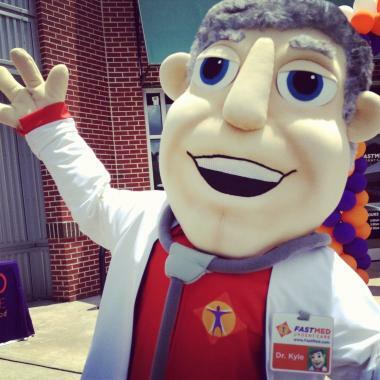 Dr. Kyle loves his job at FastMed because he gets to cure tummy aches, soothe sore throats, and bandage boo-boos for kids just like you, every single day! Dr. Kyle couldn’t do it alone, though. Dr. Kyle works closely with other physicians, nurse practitioners, and physician assistants to provide a clean, safe urgent care for kids of all ages. Kids Can Be Unpredictable, But Their Urgent Care Shouldn’t Be! FastMed Urgent Care fills the need for local immediate medical care and all forms of family medicine. We offer high-quality health care. If anyone deserves quality health care, kids certainly do! FastMed has been awarded the Joint Commission’s Gold Seal of Approval for accreditation by demonstrating compliance with the Joint Commission’s national standards for healthcare quality and safety in ambulatory health care. We are fast. If you’re a kid, an urgent care waiting room is the last place you want to be when you are sick or injured. We understand. That is why FastMed strives to see every patient in under an hour and offers online check-in. We are friendly. Going to the doctor can be scary for anyone, but is especially scary for kids. Our exceptional and compassionate healthcare providers commit to always be caring, respecting, accepting, valuing, encouraging, and understanding. Dr. Kyle expects nothing less! We are available after school and on weekends. When kids require immediate care for an illness or injury, waiting for an appointment isn’t an option. FastMed is there for you after school, on weekends, and on holidays. And guess what: you never need an appointment. We are in your neighborhood. Check out our location finder to find a FastMed near you! Hey, have you gotten your flu shot?! Don’t worry. It’s not scary! In fact, kids who don’t get a flu shot are far more likely to get sick or be hospitalized than kids who get the vaccine! Have your mom or dad check out this link to learn more!